This is not a goose or a geese. This is a work in progress. 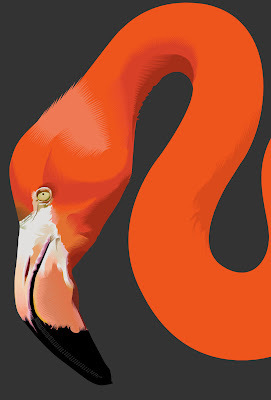 A flamingo. I am trying with this to make a very bold, motherwell type of composition with the face and part of the neck in focus, and the rest to go to unarticulated color.Not quite finished but was needing something to show you...so here goes. Saw rafts of geese on Cayuga Lake up at Sheldrake yesterday. Some were clustered by the shore and the others as huge flotillas mid-lake, taking in the heat from the water...gliding away. Mixed in with this group intermittantly were white swans. It was amazing to see all those birds--honking up a storm--creating a din it is hard to think with. Am totally in love with The Believer magazine. Read a great article on Sumo wrestling in Las Vegas, referred to by the author as the a place where they take simulation seriously. Loved that. Loved the whole progress of the story, the introduction of a little history, a little intro on the who what where and when of the sport and then, finally of the event in Vegas. Engaging and frankly, even better, fun. A good personal story of an author and his interactions with John Updike leaving the reader sad and thoughtful about their relationship. It is terrific watch the snow come down and hibernate reading. Our dining room is now Benjamin Moore red. Looks great. K back from Ontario and the winter hijinx they seem to enjoy from toboggoning to dogsledding to copious amounts of pea soup and waffle eating. She had a lovely time, but will be flagging due to lack of sleep for the next few days. We may be getting a dump of snow in the next few days. More later.